The unique hook bend perfectly fixates your soft bait without damaging it! The special shape of the hooks secures your soft bait perfectly without any big barbs damaging it. This shape allows you to hide the hook point in the soft bait making it weedless. Perfect for popular finesse applications and waters with lots of vegetation. 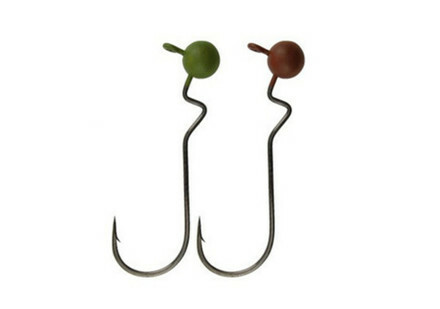 The Skip Gap Shaky Heads feature ultra sharp Gamakatsu hooks. Perfect for perch, zander and black bass with slugs, twisters and worms!